@lokki I’m using conversion from frequency to midi -64 to 64 and converting to 32uint outside of the axoloti but following the research I’ve been doing thanks to the thetechnobear’s advice you really need to be doing any conversions on the axo or another device that supports fixed point math and the Q number systems used on the axo. Having said that the best way forward seems to be to follow johannes and the others model and use functional tuning on the axo itself. This could mean an init routine that sets up a array maybe even multi dimensional i.e. with an offset indexing scheme like thetechnobear hinted at. Try thinking about the intervals as functions. 2/1, 7/4 etc or algorithmic forms rather than floats then your using the number system on the architecture itself. Much much simpler. I’m still working on it...I’m attempting to write a parser for files on the SD. The axo is by all means a highly flexible system to use and should reduce the kinds of rounding errors and problems with overflow ( especially in the smaller Edo’s ) you’ll get trying to do things elsewhere and bringing them in from outside. I forget where I saw it on here but I think it was lokki’s Remapper? that could also be pressed into service for keymappings too..
By the way Op de Couls Scala is a beast. @jaffasplaffa Floats have spoiled me too. I'd love to know if this object still works on the axo. I love to work with floats.... When I can use them as they are and not having to do all the scaling/bitshifting. I made a good bunch of modules for VCV rack and also made a couple of simple vst's and its just soo much simpler without all the scaling. I've found the maquam synthesizer patch from music tech fest 2016 that contains @johannes scala file importer. I think johannes ported it from another open source synth. Thanks for sharing this, I am going to spend some time pouring over this, pure gold. I'll fire it up later today. How to use axolotis polyphonic voice assignment for this? I think you put the scale loader and the table in the mainpatch und have the table read in the subpatch, refering to the table in the mainpatch. Does someone have any Ideas how to turn this into a system that can load different scala files? Could you replace the attribute with the filename with in inlet and then hook up several strings? I tried this but I'm not so good with code. I guess I need to move the load aspect out of the init secion in the code but I don't know how. @jaffasplaffa I’d like to check out your VCV stuff, is it online? No its was mostly for personal to start with and maybe later for a commercil package. So for now it was not released. And they wont work with 0.6 version cause I have not updated them. My plan was to make som paid modules, which I have not entirely given up on yet. But yeah I can share a couple I think. I have to dig out all out again, but if you are interested follow this tutorial, it is actually VERY easy to make objects for VCV. This tutorial is updated for VCV 0.6. 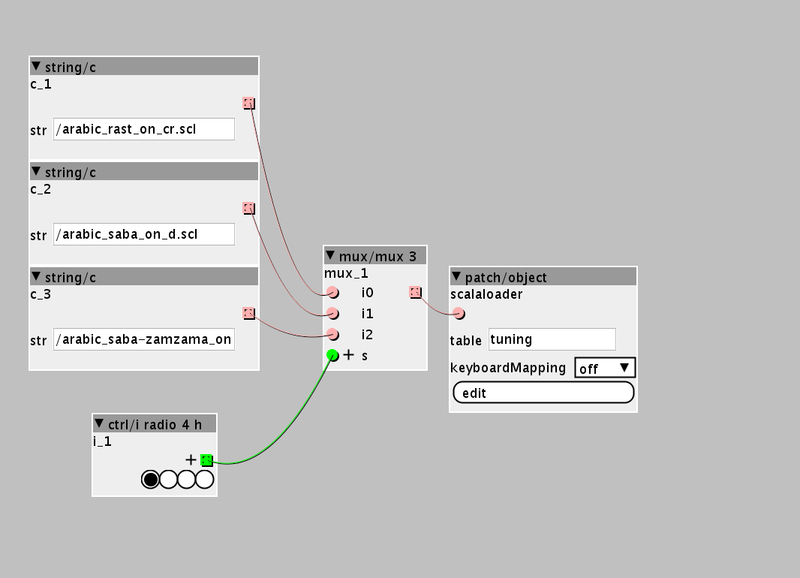 It shows all the the tools you need to install and make modules. Thanks. I’ll check that out when I get a chance. Thanks all @Blindsmyth you rock ! So cool to be able to use scala files . I will just see if i can get the bits that translate the interval ratios into axoloti domain values and go from there to make that dinamic table switching . Cool to see your VCV stuff but is going a bit offtopic maybe? @lokki Loved your outlet mapping example . Where could I get more info about editing objects ?